The 91st annual Macy’s Thanksgiving Day Parade is set to happen in New York City on Thursday, November 23, 2017. Huge crowd are expected line up in the streets of Manhattan to witness the parade of giant balloons, marching bands, cheering clowns and celebrities at the 91st annual Macy’s Thanksgiving Day Parade. This year’s most awaited Balloon Parade features fourteen popular cartoon characters where kids and kids at heart will surely love to see floating in a gigantic-sized balloon. Giant balloons includes Spiderman, Sonic the Hedgehog, Ronald McDonald, Kermit the Frog, Spongebob Square Pants, Smurf and more. New baloons such as Olaf from Frozen, The Grinch and Aflac Duck will make its debut on the parade. Performer includes Gwen Stefani, Andy Grammer, 98 Degrees, Bebe Rexha, Flo Rida, Wyclef Jean, Patti LaBelle, and the Goo Goo Dolls and more. Where to watch Macy’s Thanksgiving Day Parade 2017? 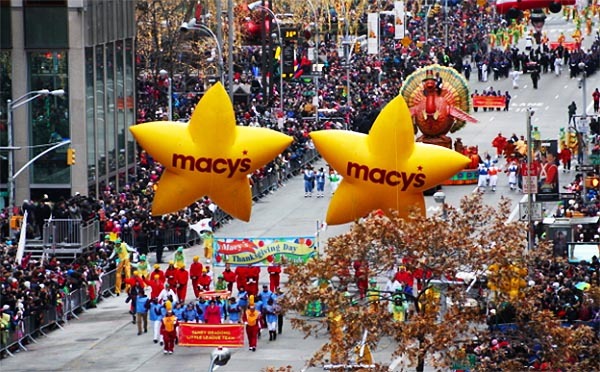 The 91st annual Macy’s Thanksgiving Day Parade will be broadcast live on NBC at 9:00 a.m. EST. The event is also available to watch online via NBC’s official live streaming channel and on Verizon’s YouTube channel in 360 view.